The beauty and curse of a biological system is that we always play the averages and probabilities because very few things happen 100 percent of the time. For any given question there are an infinite number of variables ranging from soil and weather to a farm’s financial status. Nothing is ever exactly the same. I enjoy reading the eHay Weekly. 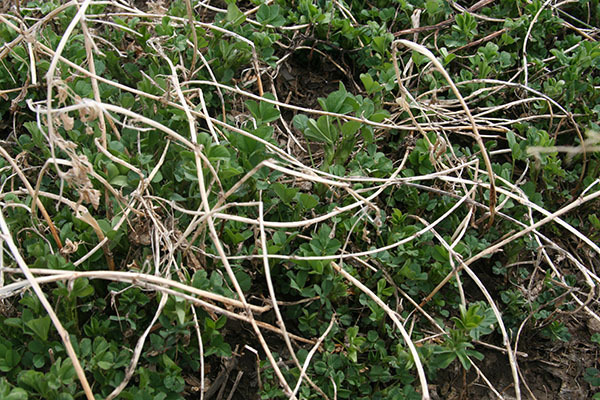 Good article on alfalfa winter injury, including the note about using stems (and not plants) to evaluate stand condition. However, as you know this assumes a clear alfalfa stand and an alfalfa-grass stand with somewhat fewer stems per square foot can still be very productive, especially if topdressed with nitrogen soon after green up. Of course a farmer would have to be on the ball, evaluating stand condition very early in the season. An alfalfa-grass stand with slightly less than the stated minimum number of alfalfa stems can at least be productive for that season. That way the farmer would have a chance to plan his rotation instead of making a quick decision. I've been amazed at how productive a grass-alfalfa stand can be when "fortified" with a modest rate of nitrogen — perhaps half the normal 70 to 90 pounds of nitrogen we'd use on a pure grass stand. This assumes, of course, that there's enough grass in the stand to make nitrogen fertilization worthwhile. Also, that the grass is a productive one — the fescues and orchardgrass are more responsive than is timothy. The email came from a longtime acquaintance, Ev Thomas — retired Miner Institute agronomist and now an independent consultant, speaker, writer and misdirected Boston Red Sox fan. Ev was right in his assessment that the table refers only to pure alfalfa stands and that an alfalfa-grass stand can still be productive with something less than 40 stems per square foot, assuming there is enough productive grass to carry the day. This is where the word “consider” (as found in the table) becomes very important. In fact, the recommendations from the table may sometimes be different for pure alfalfa stands depending on age of the stand, size of the stems, and health of the plants. I have seen research studies where maximum yields were achieved with something below 40 stems per square foot. In biological systems — it happens. In addition to raw stem count, it’s also important that other factors be considered before terminating a stand: condition of other alfalfa fields, feed inventories, and the potential for soil erosion if the field is tilled. In the Wisconsin Yield and Persistence Project where whole field yields are measured each year from production fields, alfalfa yield that was measured as a percent of the first production year held relatively constant for the first three production years after seeding; it then dropped by an average of 25 percent in the fourth production year. This held true through nine years of the project and for many tested fields. In most cases, the yield decline was caused by natural attrition in productivity rather than winterkill or injury. Is 25 percent too much of a yield hit to take? Maybe, if the cost per ton of forage harvested also goes up accordingly. Maybe not, if it might be the best field on the farm after a tough winter and perhaps alfalfa supplies are tight. In the end what we really have left is the science and the art of haymaking. Both are needed and each complements the other.